As UK frozen food retailer Iceland vows to ban palm oil from all its products, Professor Denny Ng, from the University of Nottingham Malaysia, explains why we don’t need to stop using this controversial vegetable oil if it is produced sustainably, and how his research supports this greener approach. Why is palm oil in so many products? Oil palm is a very productive crop which generates high amounts of oil per hectare. Refined palm oil is also very versatile and cheap. It is the most widely-consumed vegetable oil on the planet and its use as an ingredient is not just limited to the food industry. In fact, about half of all packaged products sold in our supermarkets contain palm oil. Soap, candles and cosmetics are just a few of the manufacturing fields that rely on it today. What are the issues with palm oil? To meet the increasing demand for vegetable oil worldwide, the palm oil industry is trying to boost productivity. The easiest and cheapest way to achieve this is to increase plantation sizes, but this has a devastating impact on native rainforest habitats, which are cut down to make way for the palm tree crops. Palm oil mills are also major polluters. The wastewater they generate is highly contaminated, while acrid black smoke produced by their biomass boilers is another environmental concern. Should we switch to alternate oils? Using another type of vegetable oil would increase the price of products significantly. It’s not economically feasible to substitute palm oil entirely. Instead, the objective should be to promote sustainable palm oil production and consumption. The entire value chain – from farmer to mill, manufacturer to supermarkets, and finally consumer – should be optimised to be sustainable. How would a ban affect palm oil-producing countries? Indonesia and Malaysia are the biggest exporters to the rest of the world. Six to eight percent GDP of Malaysia alone is based on palm oil products. An international ban could also have a significant impact on the country’s economy and create another serious social deprivation issue. Small farmers in those countries would be particularly affected by a ban, particularly if other major retailers and governments followed suit. These smaller producers often cannot afford to affiliate with the Roundtable on Sustainable Palm Oil (RSPO), the world’s most recognised certification organisation. RSPO tracks agriculture practice, processing and labour used to ensure the entire chain is sustainable. However, the fee for RSPO certification is expensive and only affordable to big multinationals. At the same time, consumer demand for certified sustainable palm oil products remains low because they cost more at the till. Malaysia Sustainable Palm Oil certification is an alternative certification with no cost to farmers, but recognition by the other countries is questionable. All these issues do nothing to incentivise small holdings to be certified, which puts them at a disadvantage long-term. How are you helping to make palm oil sustainable? To promote “real” sustainable production, the yield of the palm oil per hectare of land should be increased by improving soil health and returning the organic content from the palm oil fruits back to the soil in the form of bio-fertiliser. At the Centre of Sustainable Palm Oil Research (CESPOR), where I work, we are developing technologies that cut environmental damage in palm oil processing down to zero. Our fully-integrated Waste Recovery & Regeneration System (REGEN) system cleans and converts polluting effluent from the palm oil mill into a biogas which is then fed as power into the national grid. Meanwhile, its solid biomass waste (e.g. tree trunk and fronds) can be converted into valuable pellets and briquettes for fuel, mattress fillings and that much-needed bio-fertiliser. By implementing the REGEN system at a palm oil mill, it can recover more than 80 percent of the biomass and no waste generated from the industry. It also dramatically cuts CO2 emissions from the processing facility. It is designed to produce 24,000t bio-fertiliser, 24000t dried long fibre annually. Besides, 3MWt/h of power is produced in typical 60 t/h palm oil mill. 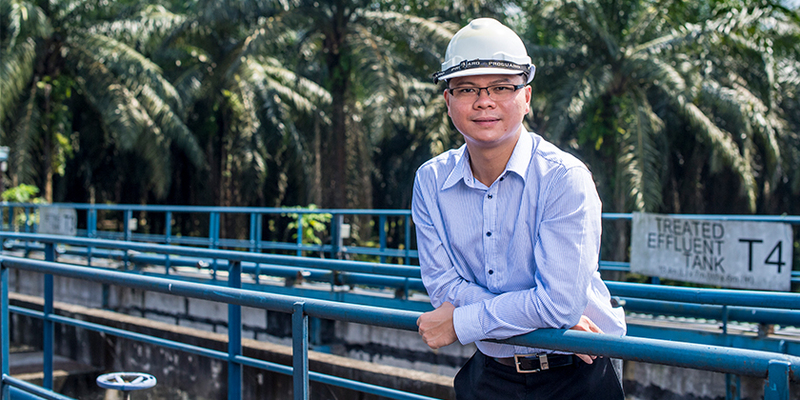 Off the back of our research, new technologies are also on the horizon to improve the burning efficiency of boilers at the palm oil processing plants. Our work aims to remove any polluting black soot particles before they are released into the atmosphere to prevent haze and harmful emissions. Who will benefit most from this work? CESPOR is helping to educate small farmers in Malaysia on the latest agriculture practices and the benefits of using greener technologies. We are collaborating with them instead of the multi-national corporations in Malaysia on the bio-fertiliser project, for example. Smallholdings need our assistance most if they are to successfully overhaul their operations to become more sustainable. If they cannot implement greener technologies, it could force them to sell their fruit at a lower price, which would increase poverty in rural communities.